The C7 Corvette Z06 is positioning itself to be the perfect starter vehicle for those wanting to get massive amounts of horsepower from the American supercar. However, for some, not even the stock supercharged 6.2-liter V8 engine is enough to satiate everyone’s high-horsepower desires. One of those unsatisfiable customers is a man named Nathan Anderson who went to Vengeance Racing for a genuinely exceptional Corvette Z06. To highlight Anderson’s monstrous Corvette Z06, Vengeance Racing made a highly stylized video about the vehicle. The theme? The Matrix. The Vengeance Racing Corvette is barely stock, producing a massive 1,350 horsepower at the rear wheels. 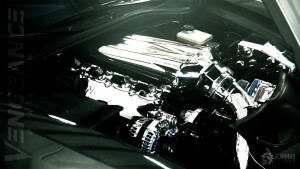 Under the hood is a fully forged LT4 engine with Vengeance Racing CNC LT4 cylinder heads. It sports an LME billet intake manifold, a ProCharger F1X supercharger, ESC 10-rib drive system, Vengeance Racing custom air to water intercoolers system, a Circle D 8L90E gearbox and stall converter, LG Motorsports spherical rear suspension, and a Vengeance Racing custom fuel system. Those are some serious modifications. The video pulls dialogue and visual cues from The Matrix movie, which is a great way to recognize Nathan has the same surname as the movie’s protagonist—Mr. Anderson, aka The One. The visual style of the video feels straight out of the late 1990s; however, it blends well with the brutal Corvette Z06 we see. The video shows the car in various stages of completion before hitting the dyno and the track, decimating the competition. The car looks menacing, too, especially with the parachute attached to the back. You know a car is serious about speed when it needs a parachute to slow down safely. Check out the video and see how fast that Corvette Z06 is—you’d be surprised. And turn up the speakers, too. i’m not very enthused with this interpretation.